Works well, allows you to cast from audio apps on your to this device. Hook it to a stereo or speaker system to make it Chromecast enabled and allow you to stream Audio to it. Some call it a poor man's Sonos, but its as good as Sonos for a lot less money. With one of these in the Living Room and another one in my bedroom. It's a seamless transition of music. Perfectly seamless. Getting another one to add the basement and making it a while house stereo. Nobody sells them anymore, I was luck to find one here, great service! This device incredible, a shame google has discontinued. That said they say will continue to support, so buy it! Many apps support chromecast audio and resource easy on your mobile device compared to bluetooth. Device supports analog connection or mini optical connection, i.e. sound quality much better than bluetooth. Optical cable not included. Bottom line turns any powered speaker or receiver into high quality streamer..cheap! The product and price are good, but I was disappointed to learn that although the company sells through a Canadian website and in Canadian dollars, it's actually a UK company, which meant a much longer shipping time and a product with a UK power plug. On balance it's not terrible, but I wish it was more upfront. Love Chromecast devices! I have two video already and was super stoked to find that Mobile Fun still carried the audio version. I work in a large space and the ability to control the music from my phone is a huge bonus. Also, Mobile Fun helped me greatly with an email inquiry about product tracking. Thanks Mobile Fun! I'll probably be buying another audio Chromecast for my home! It's a shame Google discontinued this device, because it's incredibly practical at turning any speaker into a smart speaker that can be connected to your WiFi network. Very easy to setup (like you would a Chromecast) and even easier to use from your phone or Google Home! I'd hop on this deal before they're all sold out (this website seems to have the lowest price). I am thoroughly enjoying the product. it makes streaming music to an audio device very easy. I am sad that Google has discontinued the product in Canada but glad that I could purchase it from mobile fun. The Google Cromecast Audio is hard to find in the big box stores so I was glad to see that you had it in stock and it came in a timely manor. So I placed my order on Feb 27 and I got my order March 26. I live in Calgary AB. I am very happy it came in although it took a month, at least I got it :) customer service via email is very friendly and responsive. I will recommend this to my friends and family. Great product. Easy to stream music to my hifi. Also appreciated the excellent help with a shipping issue. the chromecast audio does the simple bit awesome job of making our speaker wireless! totally worth the wait! These are getting harder to find. Through a circuitous route from a Canadian storefront, to a UK company, receiving a Royal Mail package with Swedish postage, it arrived a couple of days later than expected. UK power adaptor was not unexpected, and an easy fix. Item performs great! Check the settings to ensure you unlock the full dynamic range option, and you will be impressed my the quality. Big improvement over Bluetooth solutions. I wanted to have a complete Google Hub and Home speaker system, but I felt I had already purchased enough expensive speakers. This product allowed me to incorporate my older speakers into my home speaker system, while supplementing it with Google Minis and Homes. Super happy with the results. After 20 days, I have yet to receive my Chromecast Audio. I contacted Mobile Fun regarding the issue and they have been super helpful! 'Looking forward to playing with my new gadget soon. Works Great. Shipped quickly and well packaged. The simple operation and vinyl-esque design make this a joy to have in the system. The small size makes it unobtrusive for those that don’t want to have another bug box on the shelf. Full dynamic selection gives decent analog sound from the headphone jack. Great addition to my smart home! I bought this so we could stream music to our outdoor speakers on the back porch. Quick and easy setup since I'm already using Google home. Would definitely recommend if you want to stream music or audio to your old entertainment system. Grab them when you can! The Chromecast audio is so good they have been forced to stop making them by speaker manufactures because they turn any device with a 3.5mm jack into a full streaming speaker system, just as good (or better than) those really expensive systems. I now have 6 of these amazing devices and can stream to single devices, groups or the whole house at once. If you use an optical cable you cn stream high bit rate for the best quality (better than standard CDs - if you still use them!). Save a fortune and upgrade your devices, you won't regret it, possibly only that you didn't buy enough of them! I ordered this when they became difficult to find and MobileFun had the best price I could find. It took a few weeks to get here but it works great and we are very happy! Since Google stopped producing the Audio Chromecast I am glad there is still a source for it. Two things Canadians should note. I found the shipment time longer than usual for things shipped from the UK, though I recognize that Canadian customs might be the main cause. And because it comes from the UK the wall plug that comes with it is for UK service; easy enough to find a North American substitute. It works flawlessly. One minor niggle. In my haste to complete my order I failed to notice where your company is headquartered...the UK voltage power supply does me little good on this side of the pond. (Chuckling..) That aside, I was pleased. Fair price, reasonably timely service. Thank you. In my case, the install was a bit clunky - at one point I was informed that it didn't work, which sent me off debugging router settings for an hour until decided to try running the device anyway, and all was OK. I've also struggled with the volume settings which don't seem to stick from one Chromecast app to another. What I'd really like is to be able to just pass the audio through at "full blast" with no volume control, and manage the volume from the stereo. The device works well plugged into the optical port of my Schiit Bifrost DAC, and sounds quite good there. Bear in mind Google has discontinued this device. I'm sort of tempted to buy a half-dozen, but I don't have a good feel for how much I'm going to end up using it. Perfect for my google home setup. I love saying, “Hey Google, play some 80’s music on the Stereo”. Instead of playing on my google mini, the tunes start piping out of my hi-fi system with he chromecast audio. Love it! I received what I wanted at a great price and received it in record time! Thanks! I just placed my order yesterday (Feb 27) I will update this review once I receive my order and will keep you posted about the progress of the order. I knew that Google was discontinued in these, so I wanted to order one before they ran out. Mobilefun had some available so I place an order. I then received the letter that they're out of stock and that I could choose another item of the same value. I asked if I could have my money back instead but got no reply. A few weeks later this Chromecast arrived in the mail, and it was in great shape. The only problem was the electrical connection was for European standards, as this product looks like it came from sweeting. not a big deal just had to use a different USB electrical connector for the power cord, but would have been good to know that it was out of stock and that the product was for the European market at the US market. Now that Google discontinued this product, they are hard to find. Thank you for having them in stock Mobilfun and thank you for the quick shipping. I would gladly do business w/you again! I received a Chromecast Audio with a 5V 1.0a power supply which has three prongs in an unusual configuration which does not work with American electrical outlets. Two large fat horizontal prongs and one tall vertical prong. I am disappointed that after waiting 10 days, I only have half of the Chromecast Audio product, while the package appears to have been shipped internationally, the shipper should have known that the power supply being sent to America would not work! Very easy to setup. Had it running in 5 minutes. I'm using this to stream music from my phone to an older stereo receiver in my workshop. It includes a USB power adapter, but I'm powering it off of a standard USB port on an alarm clock. Audio quality is great, and the phone controls are easy to use. This is the perfect product for a Google-run whole home audio integration. I don't understand why they discontinued it, but get one while they last! This audio chromecast is amazing. I thought of buying Sinus speakers for my living room but now I have 5.1 surround with this audio. Wish I knew about this long ago. Sadly Google is stopping the manufacture of this (but will keep support) so get one fast. 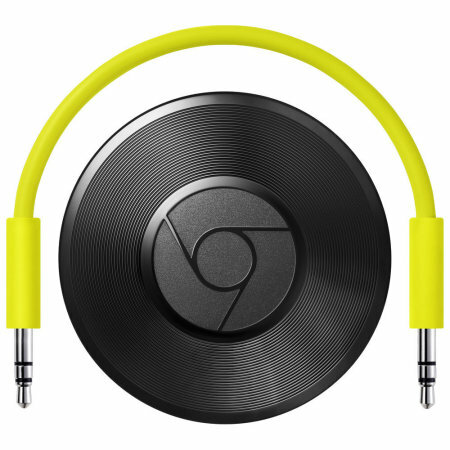 Chromecast audio. Great little product, easy to set up. Quick delivery. Good price, best I could find. Using this device to allow streaming Spotify on a hi-fi. Probably there is an argument for getting the regular chromecast, but we just needed audio.